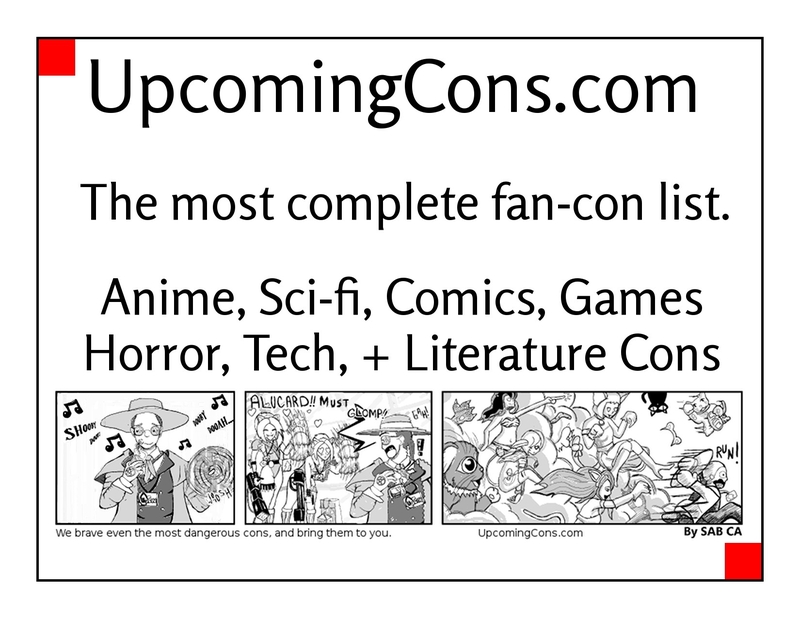 UpcomingCons is the largest, most complete list of fan conventions anywhere. Our combined list of anime conventions, sci-fi cons, comic cons, and others is the best way to discover new, geeky conventions in your area. We also have several guides for organizers and attendees. Our technology is unbeatable, and our search engine lets you search for cons within 75 miles of your hometown. We have brought together original reporting, full convention listings, and massive picture galleries for pop culture events since early 2009. As the largest fan-event website, we are always looking for new opportunities. We have opportunities for contributors interested in submitting conventions, writing reviews, and doing photography, in addition for opportunities for corporate sponsorship and advertisement. We are proud to be a member of the fan community, so we offer free ad-swaps with conventions, and we providing convention listing widgets for webmasters to use on their websites. For information, you are welcome to contact us. Congoers interested in finding new conventions are advised to use the search bar at the top of the website to find conventions near them - simply by typing their location. Fans can also create accounts, which allows them to add conventions to their log profile of conventions. This feature is currently being expanded to help fans find roommates, rides, and build congoing groups, but some of these features are still in beta testing. If you are trying to reach out to more conventions to attend, we have tons of conventions listed and you can contact them directly via their own websites. We have a database of guests and industry members. If your information is wrong, you may edit it directly on your page, which we will review and approve within 7-10 days. We can not accept requests to add you to all the conventions you've attended, because this database is a work in progress. If you would like to advertise, you may upload your ads directly on this website by clicking here. We strive to cover and include all fan and pop culture conventions with over 100 attendees, and we would love if you would add your con. Conventions can also edit their data directly on the convention page by clicking the "Edit" link - which we then review and verify before posting within 7-10 days later. Every year is treated as a new convention, so that we maintain a historical archive of past events - do not simply 'edit' a con for a new year, create a new listing instead. If your convention would like free publicity and coverage, we will come to any events with over 300 attendees if you cover cost of travel expenses (from $200 to $500 by distance). We strive to maintain some of the best reviews, pictures, and listings, so if you have trouble you should contact us. If you want to trade ads, put this ad in your program book, and email us a 468x60 jpg image. If you would like to advertise for a long period, you may sponsor our homepage and have rotation in con listing ad spots for $500. If you are with a convention with over 600 attendees, we will have upcoming opportunities for partnership, equipment sharing, technology sharing, and information trading. We currently have the most advanced con registration system any con has access too (it automatically sends confirmation emails and automates at-con reg). If you are interested in investing time, money, or resources into this con-sharing program, please contact us. We encourage conventions and fan-websites to link to us or to add our con list widget. Ryan is the organizer of many anime conventions, and he has reviewed or photographed over thirty conventions. He started UpcomingCons in June of 2009 to expand the love of congoing to others. Mary Anastasia, as regular convention artist alley participant and hat seller, is something of a mad hatter. She helps keep convention listings as current as possible and assists with news stories. Co-founder and creative director of GirlsOfTheCon.com, a website dedicated to convention girls and bringing the creativity and Inspirational fashion and design of the sci fi, fantasy, gothic, steampunk, horror, and alternative cultures and genres to the eyes of the often over critical mainstream. Contact Jason at GirlsOfTheCon.com. Co-founder of GirlsOfTheCon.com, a website dedicated to convention girls and bringing the creativity and Inspirational fashion and design of the sci fi, fantasy, gothic, steampunk, horror, and alternative cultures and genres to the eyes of the often over critical mainstream. Contact Traci at GirlsOfTheCon.com. Eddie has been documenting conventions and cosplay culture since 2005. Through a photojournalistic approach, he has been working to draw interest to this unique genre and to help promote smaller conventions and the cosplayers that attend, both good and bad, to larger audiences.